Jon McNaughton’s new painting, depicting President Donald Trump clutching an American flag on a football field, sparked Fox News commentator Sean Hannity to poke “the left” on Twitter by asking for reactions to “provocative” art. The painting aims to laud Trump for speaking out against professional football players who knelt during the national anthem to protest police brutality, says McNaughton, who calls himself a “political painter,” in a YouTube video launching “Respect the Flag.” NcNaughton has painted a series of controversial paintings that are favorites of conservatives, such as Hannity, and the painter underscores their friendship on his website. 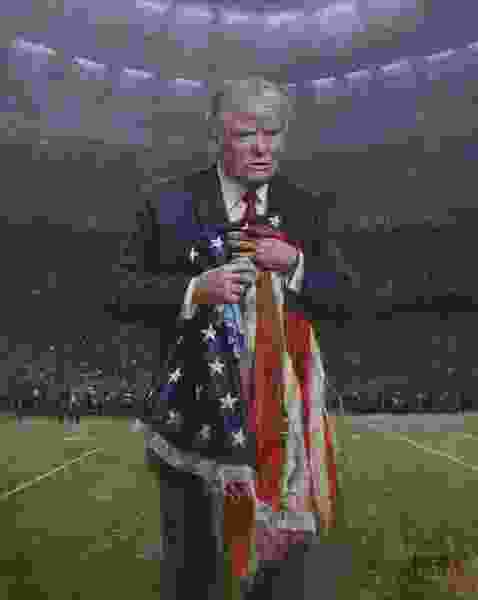 As a work of propaganda, the painting fails to aesthetically elevate Trump or the flag as an emblem, says Bradley H. Kramer, an anthropologist who teaches at Utah Valley University in Orem and curates exhibits at Provo’s Writ & Vision bookstore/gallery.